A Huge Success at VIR! 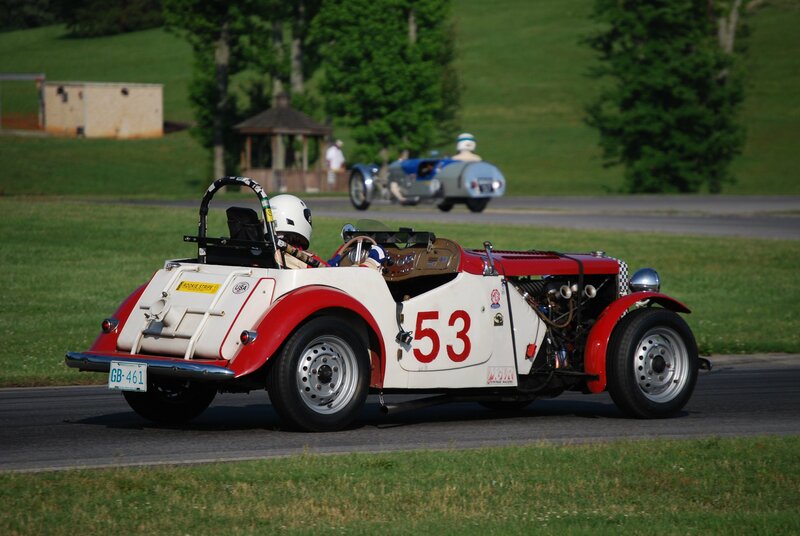 The MG Vintage Racers celebrated their annual Focus Event at SVRAs Heacock Classic Gold Cup race at Virginia International Raceway, June 5-7, where all MG racers were encouraged to come. Even with a depressed economy, an impressive 66 MG racers showed up to have a go of it! From Pre-War MGs to MGB-GT-V8s! The weekend featured two special races: The MG-Morgan Challenge on Saturday (As both MG and Morgan were featured), and an All MG Race on Sunday. SVRAs Competition Director, Carl Jensen, said of MGVR: The entire SVRA staff is always happy to see the MG racers come to one of our events. They are the best organized and most well run large organization that we deal with! A great group of well driven cars that put on a great show for the spectators. Although it rained on Friday, both Saturday and Sunday were perfect, as racers diced on VIRs 3.27 mile, 17 turn roller coaster road course in the lovely countryside of Virginia. MGVR presented two special annual awards for MG racers at its banquet Saturday evening, and added a third new one. The new award is the MG-V8 Challenge Trophy, which will be awarded to the first MG to take the checkered flag in the All MG Race. Its inaugural winner was Les Gonda, in a MGB-GT-V8, although hot on his tale - within a few seconds of him - were an MGB and MGA! The MGVR Spirit Award - as determined by a vote of the MG racers at the event - went to MG Midget driver Jack Cassingham as having the right MG Spirit, and the Bill Parish Memorial Trophy for the MG person having the most MG fun went to MGTD racer Manley Ford. Another significant upcoming MG race event will be this September at SVRAs U.S. Vintage Grand Prix at Watkins Glen, which will host the 25th running of SVRAs Vintage Collier Cup race for MGs. A large turnout of MGs is expected for it! Plus MGVRs Focus Event for 2010 was announced during the weekend. It will be with VARAC at Mosport next June. For additional information contact Chris Meyers of MGVR at (editor@mgvr.org) or Sportscar Vintage Racing Association at (www.svra.com). Additional MG racing information is available on MGVRs web site: MGVR.org. Photo of Jack Cassingham with Spirit Award is attached - no photo credit necessary. Jack is holding the Big Copper Bucket. To his left is Chris Meyers, head of MGVR who presented it to Jack. Also a photo of Rachel Prehodka-Spindel racing #53 MGTD at the event in the MG-Morgan Challenge Race (photo credit Chris Kintner). Notice Morgan Trike in background of photo. Additional photos of MG racing and MGVR activities at VIR available on request. "The Past Racing Into The Future MGVR"